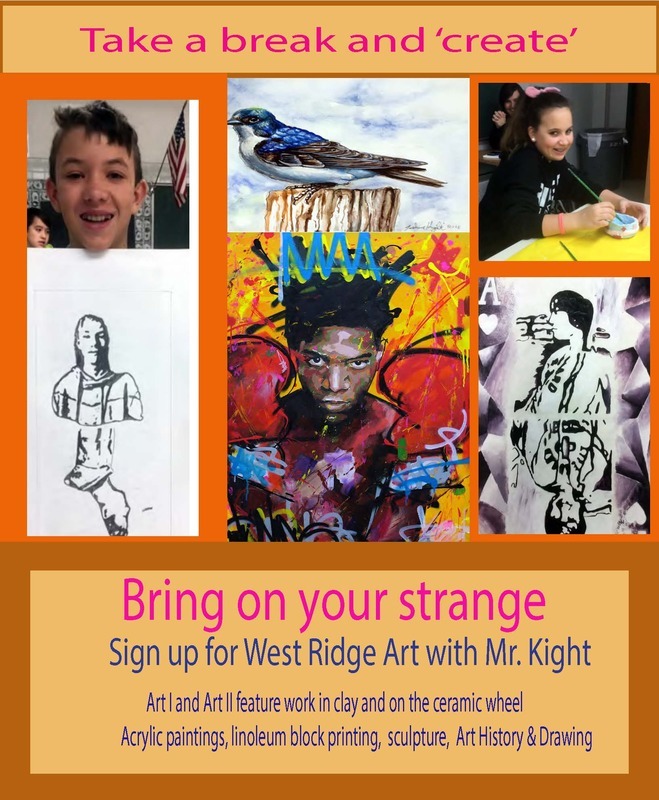 I will be teaching 7th and 8th grade art and 6th grade art at West Ridge middle school. Students will experience ceramics , drawing , painting , scratchboard , printmaking , and an art history component. I am at West Ridge again fulltime but my fruitful collaborations with Ms. Del Hierro ,over at Hill Country Middle School will continue when we meet during inservice .I had a marvelous summer participating in a group show at the Small Gallery in Dallas with 3 paintings and refreshing my etching skills with a course at ACC.I will be having an exhibition at "Strange Brew" in April/May of 2017. I am working for a solo show currently at a gallery in Houston that opens May 4th 2019. I have been teaching art in the eanes school district since 1985 . I am married and have 4 children all of whom have either graduated from or are currently enrolled in Eanes schools. I have an MFA in painting from the University of Texas and a 30 year exhibition career in the visual arts .I delivered the Paul Hanna Lecture at the Amon Carter Museum in Ft. Worth in 2002 and was a Hunting Art Prize finalist in 2009, to name just two of many exhibitions I have been a part of.. I am also a published poet having poems in the 2009 edition of the "White Pelican Review" and the 2006 spring edition of "Pinyon". I drew the Illustrations for a children's book called "Oh to Glow" in 1991 . So, I have a wide variety of experience in making art to call upon. Ms. Del Hierro and I have had many medal and ribbon winners in the district UIL competitions over the years . I am particularly charged up this year from .My art History slide shows will have more interesting details than ever. I also completed a particularly satisfying commission for a collector in Florida. I pushed hard exploring several innovative painting techniques several of which I hope to use with my students.Museum trips to the Blanton and the Houston Museum of Fine arts also added to my energy level this year. 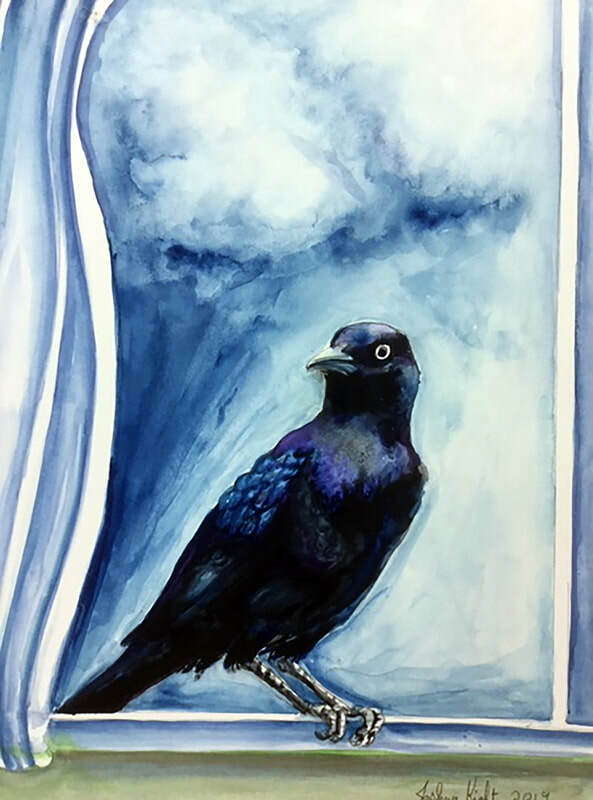 I spent the year of 2016 -2019 painting a series of (modern looking ) Great plains animals . I am teaching a basic Graphic design course at ACC , South Austin Campus. Art Students at West Ridge middle school , whether they are 6th , 7th or 8th graders will need 3 things to start . 1. A Sketchbook( we use these to practice skills and prepare/brainstorm for projects . ) Students receive a sketchbook grade every 9 weeks.7/8th grade will be expected to have 16 sketches , 5 of those detailed . 6th graders will be expected to have 10 sketches , two of those detailed. A detailed sketch is a 'finished' drawing. There will also be daily assignments .You can buy a sketchbook in the school store or at any art supply store (Michael's , Hobby Lobby ) also Barnes &Noble or even HEB. The sketchbook should be at least 8 1/2"x11" , It should contain drawing paper suitable for pencil and charcoal ( not newsprint or tracing paper)with no lines on the paper. These can also be gotten through the school. 2. Two regular #2 pencils wooden with erasers not mechanical , which will be contributed to a pencil fund that everyone may use. 3. A Ten Dollar art fee paid through the school . Late Work:Students will be given a day for each day missed to make up late work. will be a discussion grade. We will watch slide shows that are relevant to the units we are working on and the students will develop their sense of taste by questioning . I minored in art history in graduate school and depend on extensive reading and research to give answers that will hopefully stimulate a lifelong desire to go to art museums and experience the rich culture of visual art that has developed over the centuries. 3. Be respectful of the other students and the building. 3rd offense : student is sent to the assistant principal. I am off 7th period during the day for any parents that would like to meet with me. In November we will be working in clay( the wheel ) in 7th and 8th grade. 6th graders will be finishing up and transitioning to their next part of the rotation which will be keyboarding from art.